"At the first, he got banged into, and I thought all chances had gone," Quinlan told BBC Sport. "It was just fear keeping me on - I was hanging out of the back door and praying to God that he'd keep me on. He travelled superbly - he's just jumped and travelled - he's very tough, especially for a veteran. "When we hit the line and had won, you fill up inside - it was emotional. I don't get very emotional but to win a prestigious race like this is probably going to be the highlight of my career." This was something of a story-book win for Sean Quinlan. 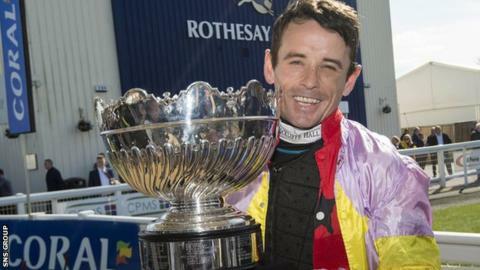 Once renowned as one of the 'wild men' of the jockeys' changing room, he once found himself in court after a pub fight, but no one ever doubted his talents. With the support of friends, agent Richard Hale, and his own efforts, he's worked his way into a position where he's something of a go-to rider on jump racing's 'northern' circuit. The victory was also a notable one for that circuit in its own backyard. Compared to its southern cousins, things are not so prosperous in the north, but given the right material, the likes of Nicky Richards can certainly deliver as has happened here.